Lines open 8am to 8pm daily. Newlite are specialists in the supply and installation of market leading PVCu sash windows. If your home is one of the many in the area with either old original timber sliding windows that need replacement, we can help. Our sash windows are ideal for new windows or the replacement of old timber sash windows. Our wide range of quality PVCu sliding sash windows can accurately replicate the appearance of your original windows. Authentic sliding sash windows in high quality PVCu. If you have a Victorian, Edwardian or any other kind of older property fitted with sash windows, there is no need to lose the authentic features of your old windows when replacing them. We can offer you a wide range of sliding windows that will be a credible alternative to your original sash windows. Carefully chosen and with our expert help and advice, it will be hard to distinguish your new windows from your old ones. PVCu Windows suitable for timber window replacements. We source our windows from only the very best designers and manufacturers of sash windows. All feature high security, excellent energy efficiency and authentic detailing. Elegant in appearance and design they feature attention to detail and will enhance any property needing sash windows. Deep bottom rails found in old timber windows. Mechanical joints to replicate timber window joints. Sash Windows with tilt in facility for easy cleaning. Authentic looking low maintenance PVCu sash windows. Integrate well with any kind of design and property. High Security with ease of use. 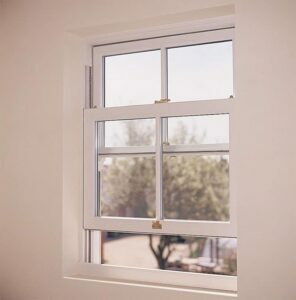 Our sash windows are glazed with the very latest in high specification double glazed units, featuring argon gas fills, warm edge spacer bars and low emissivity coatings. All hardware is authentic in appearance yet tested for high security. We offer brass latches, tilt knobs, bottom sash handles and much more. In addition you can opt for tilt in sashes to facilitate easy cleaning. Sash Windows installed by your local home improvement experts. Newlite are your local experts in the installation of high quality PVCu sash windows. Contact us for a free, no obligation quotation or consultation. Outstanding service from salesman, installers, right from the start. Just had a new front door fitted and all involved went over and above to complete a professional installation. We have always used Newlite and would recommend them to anyone looking to replace windows, doors, etc. Thank you so much for the new fitted window Alan – really smart and easy to operate, good clean job. Highly recommend Newlite to anyone. We’re overjoyed with our new Slimline aluminium patio doors inc remote controlled blinds. They simply look amazing. Mr & Mr B ….. Bexhill-On-Sea A customer testimonial from a recent client that transformed their penthouse extension with new slimline aluminium sliding doors and lantern roof. Alan, we are very pleased with our new windows. We thought Lee was a nice guy and have no qualms about his workmanship, which was excellent. By all means, take a picture and thank you for everything. We’ll certainly recommend you if any of our friends need any work done. Thanks again. Professionalism and customer service is superb! We would highly recommend Newlite. The quality of workmanship, professionalism and customer service is superb! We are so looking forward to many years in our beautiful new room. A very big thank you to Alan and all the Newlite Team. From sales through to design to application, supply, construction and finishing, the full service was clean, tidy, respectful and efficient. We would recommend Newlite to any prospective customer. Hi Alan, it looks really lovely and I’m extremely pleased. Just need carpets, curtains, etc. Thanks for all your help; the guys who did it all were fantastic – efficient, polite and friendly – so please pass on my thanks to them. Hello Alan, hope you are well and keeping busy. I have just remembered that I haven’t confirmed how pleased we are with our windows and that we were especially impressed with Lee’s efficiency and courtesy during the installation process. He was a pleasure to have working here. This is the third time we’ve used Newlite over the last couple of years. The advice Alan gives with all his experience and the quality of the fitting is simply outstanding. The door looks amazing, we are so pleased. The right level of honest advice I needed. The service was clean, tidy, respectfull and efficient. A very BIG THANK YOU to Alan and all the Newlite Team. From Sales through to Design, to Application to Supply to construction and finishing. The service was clean, tidy, respectfull and efficient. Would recommend Newlite to any prospective customers. Kind regards, Pete and Denise, East Sussex. Newlite Service Impeccable from start to completion. Hi Alan, Hope you are well and keeping busy. I have just remembered that I haven’t confirmed how pleased we are with our windows, and that we were especially impressed with Lee’s efficiency and courtesy during the installation process. He was a pleasure to have working here. We are so pleased with our new bay window complete with GRP roof & base. A Fantastic service from start to finish installed by the best installers we could of dreamed of. We must have done our research very well! You read so much about double glazing salesmen that you never know which to choose. We must have done our research very well as your team were a testament to the work ethic you advertise. No hard sell, no pressure, everyone involved in the process, salesman, estimator, stained glass designer and fitters who called at my home was courteous and considerate. All appointments were made and kept and the windows were fitted ahead of your estimated timed. I would recommend Newlite to anyone. The fitters did a beautiful job and were so clean and tidy. An excellent job all round. I would personally recommend Newlite to anybody. Excellent job carried out by Lee who was efficient and personable. Newlite installed all of our white slimline aluminium windows. We wanted to retain the original character of the property and love the elegant slim look of aluminium. Alan was very knowledgable and helped us a great deal with the design and Lee the installer did a faultless job. Newlite have installed all of our windows and guttering. We have used them a number of times and find the service and workmanship excellent. We opted to have Oak Pvc windows with clear shield A rated glass which looks fantastic. An exceptional service from the initial design stage with Alan right through to the completion of the conservatory fitted by Lee. We are so pleased with professional work carried out by Newlite. I was so impressed with the two installers that came to fit the doors and windows.They were punctual polite and left no mess, Nothing was too much trouble, please pass on my thanks. I am absolutely delighted with the work Newlite have carried out. The orangery looks better than I could of even imagined, the product is fantastic & the workmanship is exceptional. I would recommend them to anyone. How much do aluminium windows cost? The team at Newlite have been helping home-owners in Sussex, Surrey and Kent improve and add value to their properties for over 25 years. Top brands of PVCu windows and doors at great prices. Inline or Lift and Slide Patio Doors. What is the difference? What to look for when buying a composite door. Surrey, East Sussex, West Sussex and Kent. Simply fill in your details and we will call you back. We will try to call you back as near as possible to your preferred time.